Once upon a time, information architects and web designers fretted about “click cost” because the “cost” was both tangible and emotional: time and frustration. “Click cost” is not the “pay per click” or “cost per click” associated with ad buys. “Click cost” represents the time involved for a page to load or the cognitive effort that follows after someone clicks on a link. It’s the delay on load. The link to something unrelated to the promise of the hyperlink. The 404 error. The need to find and navigate additional drill downs. It’s anything that qualifies as taskus interruptus. Today’s designers often do not think about the first element in that list: delay on load. After all, we live in an era of “broadband” rather than 28.8 dial up. Except, of course, if you’re using a mobile device to access the Internet and you’re not in a major metro area. In that context, “click cost” is related to page load speed. Which is, in turn, a function of code, number and size of images, Flash, anything that has to load from external sites (think ads), iFramed content, and so forth. For this analysis, I’m exploring the last item in that string: finding and negotiating additional drill downs to reach the content promised by the hypertext language. This painful example begins on LinkedIn, where many job inquiries get started. 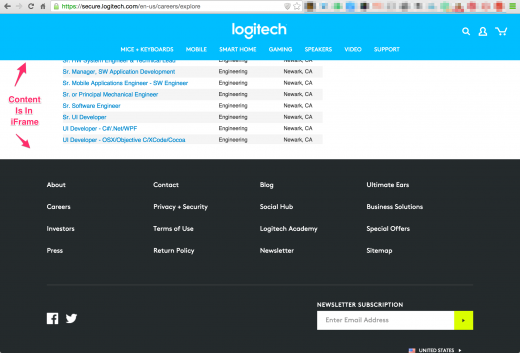 I was surprised to see Logitech in the “suggested jobs” box on my LinkedIn jobs page. I didn’t know that Logitech had a Washington location. Cool! So I clicked the link, and landed on the official Logitech LinkedIn page, the normal behavior inside LinkedIn. 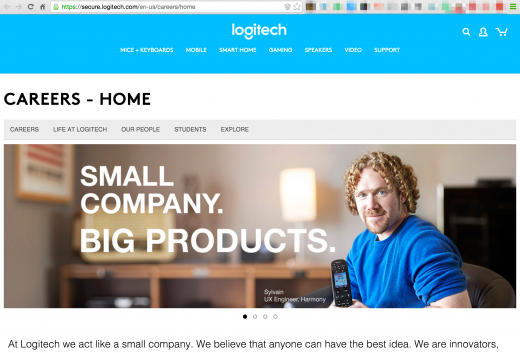 Click One leads to LogiTech’s official LinkedIn page. 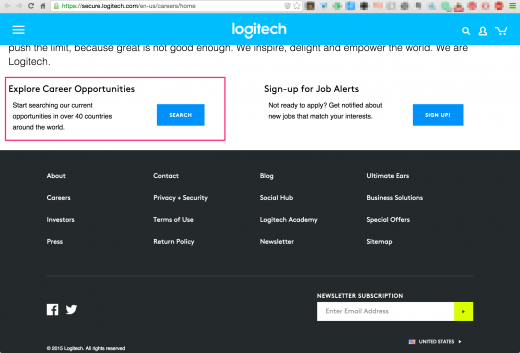 When I click a link like this one (“search for openings at Logitech”), I expect to land on a page with either a list of jobs (smallish institution) or a page with search options/filters (large or global institution). Often these filters are by location (state, city, county) or job type (e.g. IT or human resources). That’s not the page I landed on. 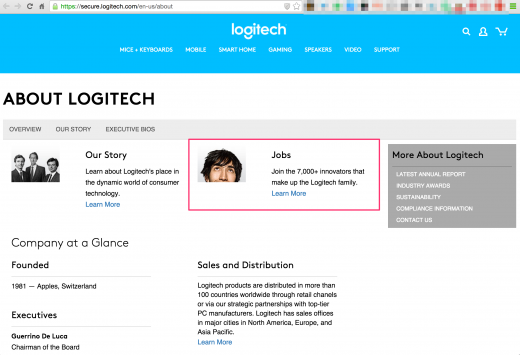 Click Two leads to an “about Logitech” page not a “jobs” page. The person(s) responsible for the Logitech LinkedIn page have decided to link “search for jobs” to an “About Logitech” page. The click cost adding machine has now kicked in. Yes, “Jobs” is featured here. But “Learn More” is a weasel set of words for a hyperlink: it provides no context. Learn more … about what? Moreover, the phrase is used three times on the viewable (above the fold) page. Which means those writing the website think we are going to read everything above the link to see if we want to “learn more” about that topic. And which means no one gave thought to voice readers, which read the link text outloud. 2. What happens when I click “learn more”? Exactly what you’d expect with a non-specific link … a “general” page. Please don’t use “careers” as a label. It is less useful than “employment” as a label for “I’m looking for the jobs listing” task. What’s offered are “jobs”. The job path forms the career. And while many of us want to “be employed” we aren’t looking for “employment” — that’s not the task word. Most of us — especially when we’re talking about the kinds of people who are coming from LinkedIn — are looking for a specific kind of job. In this case, the link takes me to the top-level “careers” page. The click cost adding machine has now kicked into high gear. Click Three from a non-specific hyperlink leads to a portal-type page. I’m not going to go Edward Tufte on you about the lack of actionable information on the screen. I am going to groan because we started this journey hoping that one or two clicks would lead to a jobs listing. 3. To get to click four, I have to scroll past big images. Images that are not actionable. In other words, I can see four images of employees, but I can’t do anything afterwards. Here we see another promise, this one embodied as a search button. Interestingly, the “sign up” link goes to the same page as the “search” link. You’ll need to click “sign up” one more time if you want alerts. Click Four jumps down the Logitech Careers home page. 4. Finally, a search-available-jobs page. Click five brings me to the page where the initial LinkedIn promise should lead me. 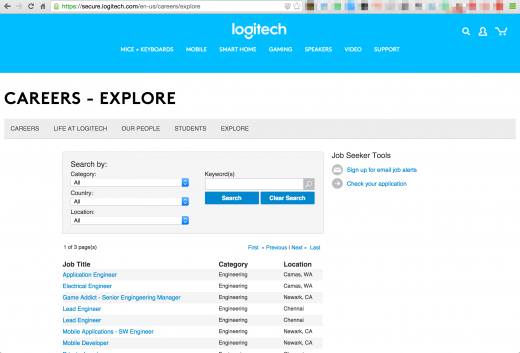 Click Five is a form that lets me filter jobs available at Logitech. This page presents its own user experience challenges, however. Should you jump straight to “location” (as I did), you will be sad unless you are already very very familiar with Logitech. That’s because the locations are alpha by city. No country grouping. No state grouping. Wowza! The Logitech filter-by-location dropdown is ordered alphabetical by city. There is no country or state ordering. From Alexandria, Australia to Zurich, Switzerland … with exceptions for India, Thailand, Thailand, and the United Arab Emirates. Only UAE has a listed, for a job in Dubai. But if you had gone straight to Dubai, UAE, you would have been told that there is no job opening. 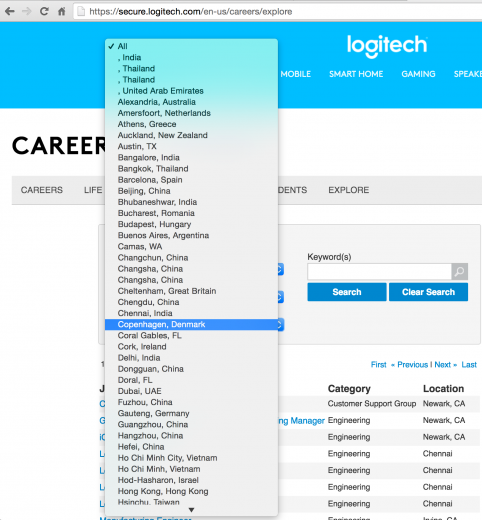 Logitech UAE reveals a job only if you start without a city. The job listing is via a third-party service, Jobvite, and lives on the Logitech website courtesy of an iFrame. I know that this is standard-operating-procedure for jobs sites, but I don’t have to like it. Often iFramed jobs pages are unfriendly on mobile devices. In this instance, however, I found the user experience to be better on mobile. I can see exactly how many jobs are open in any given category. I still don’t have any idea about where they are located, however. And it was the hint of a job in Washington that started this exploration. 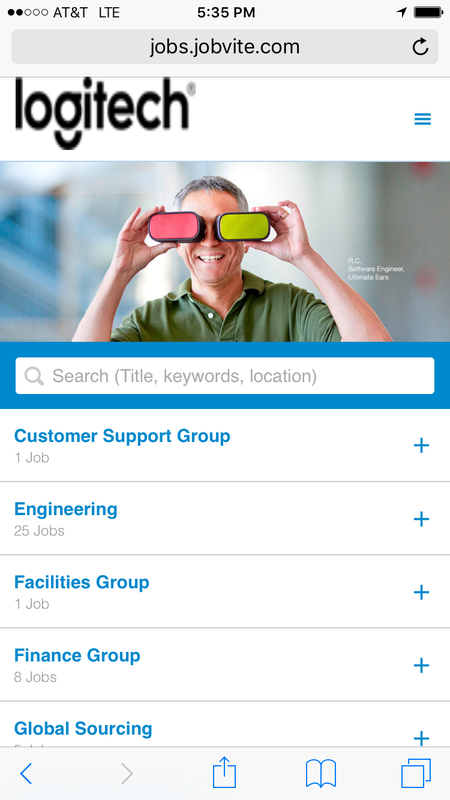 Mobile view of the Logitech jobs information lives on the Jobvite site: no embed, iFrame. On the main site, I tried searching with “WA” (the abbreviation for Washington) as a keyword, but that was not successful. By reading that very long dropdown list, I discovered that there is only one Logitech facility in Washington, Camas. Camas is located northeast of Portland, Oregon.